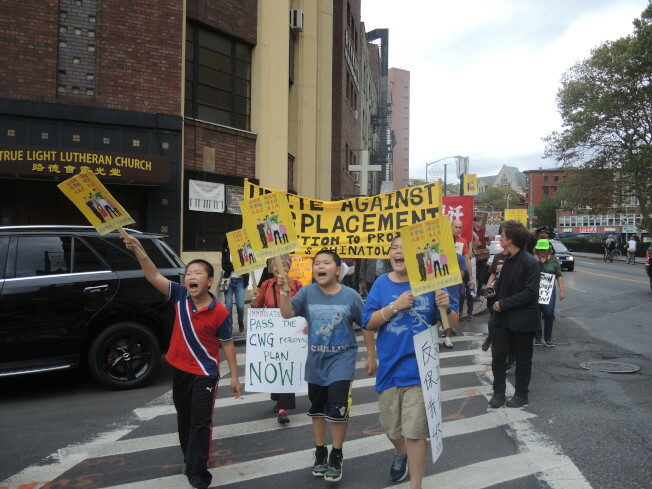 On September 25th, about 1,000 concerned community members from the Lower East Side and Chinatown marched from the community to City Hall, and delivered to you a letter requesting adoption of the community rezoning plan, also known as the Chinatown Working Group rezoning plan. After our community was excluded from the 2008 East Village rezoning, we spent 7 years working to craft a rezoning plan to protect the entire community. The Coalition to Protect Chinatown and the Lower East Side is excited to welcome a new member, the Lower East Side Dwellers. We’re also excited to announce several new endorsers: Frank’s Chop Shop, Legal Services Staff Association, UAW Local 2320, Movement to Protect the People, S & J Grocery Inc., Take Back the Bronx, Trinity Lutheran Church of Sunset Park and UPROSE. Hundreds of Latino, African American, Chinese and white residents, workers, students and business owners have taken hours out of their busy days to go door-to-door or stand on the street and distribute flyers, posters and petitions in opposition to discriminatory zoning, high rents and displacement, and in support of the Chinatown Working Group (CWG) rezoning plan that will protect the entire Chinatown and Lower East Side area in Community District 3. The people of Chinatown and the LES are ready to come out in full force next week. Join us to demand that the city pass our rezoning plan and stop the displacement! Why do we need the CWG Rezoning Plan? In 2008, the East Village was rezoned to protect their neighborhood from luxury development and the displacement that goes with it. Chinatown and the Lower East Side, poorer communities of color, were intentionally excluded even though all 3 neighborhoods are part of the same Community District. The Lower East Side and Chinatown have united to pass our own rezoning plan. Learn more! 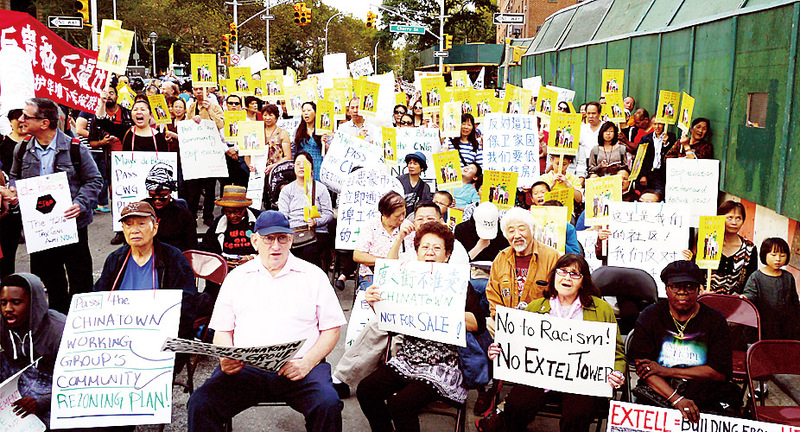 On Friday, residents, workers, local business owners, students and concerned community members-including children and elderly-of the Lower East Side and Chinatown rallied at the site of the controversial 80-story luxury tower being built by Extell. 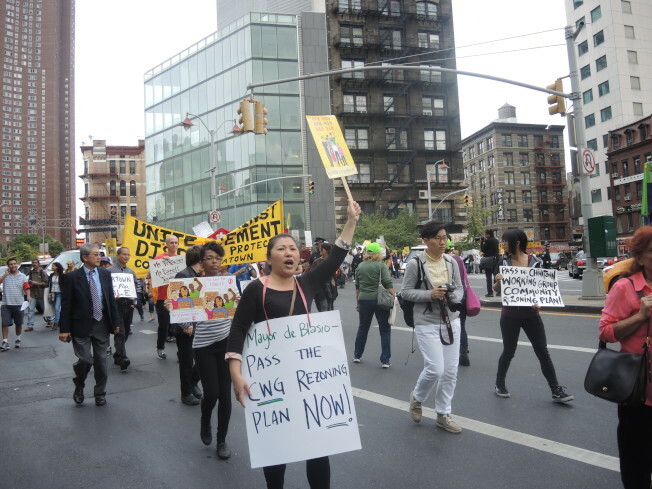 Hundreds of community members and supporters protested the building of a luxury building in their backyard and demanding Mayor de Blasio adopt the Chinatown Working Group plan to protect the Chinatown and Lower East Side. For years, the Lower East Side and Chinatown have been left wide open and vulnerable to luxury towers. Meanwhile the wealthier, white East Village has been afforded protection through a rezoning which capped building height limits. 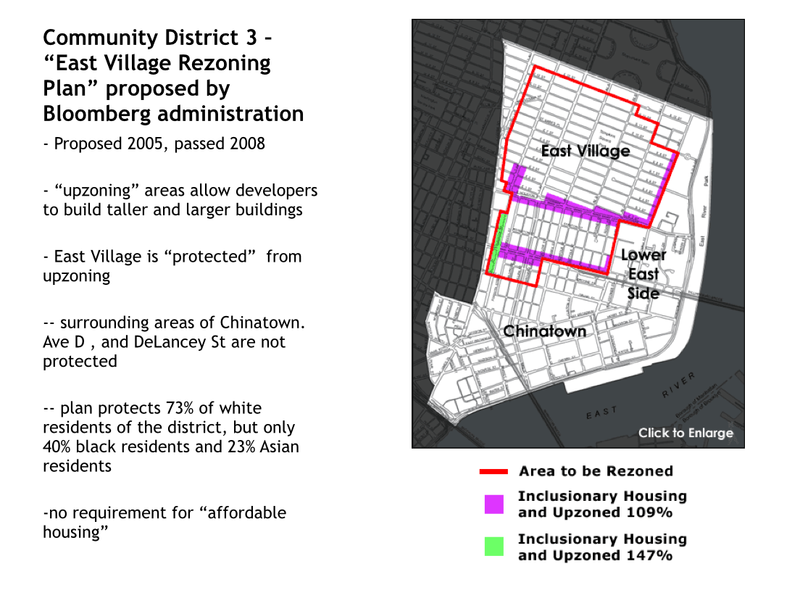 The Chinatown Working Group worked for 7 years on a rezoning plan that preserves existing low-income housing in area, as well as protect the communities from future luxury development. In 2012, 10,000 residents signed petitions in support of this plan. Coalition members and community members are outraged that the Department of City Planning recently turned down this plan. In recent years, rents have skyrocketed, evictions are rampant, luxury buildings and hotels are replacing long-time affordable homes and businesses, schools are severely underfunded, and the entire community is being pushed out. 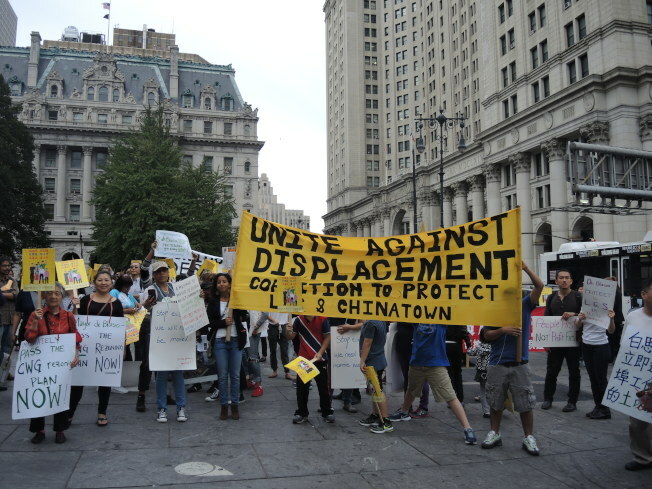 David Tieu, of the Coalition to Protect Chinatown and the Lower East Side said, “The 80-story Extell tower is the clearest example of why our community needs a rezoning plan now. 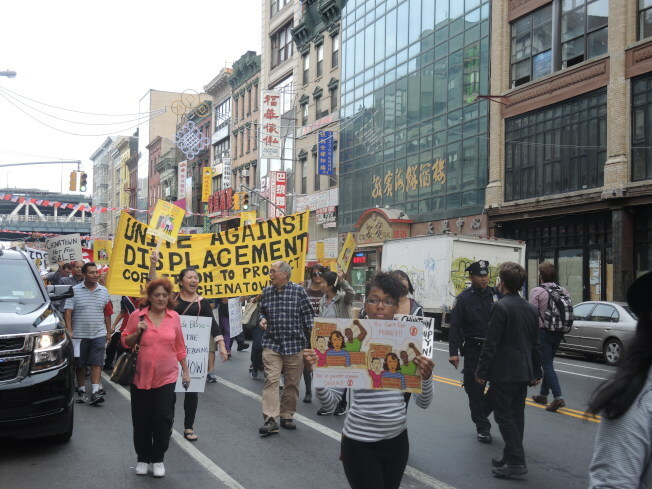 For almost 7 years, the Lower East Side and Chinatown have united to create the Chinatown Working Group rezoning plan to protect its residents, workers, and small businesses from displacement. Thousands of people have been involved and support this plan. This is why we say it is undemocratic and racist that City Planning rejected the plan. We demand that de Blasio do the right thing- stop Extell, end the 421a, and pass the Chinatown Working Group plan now.” Protesters also vowed to return if their demands were not met. Other speakers at the rally included Jenifer Rajkumar, district leader; Louise Velez, National Mobilization Against Sweatshops; Norma Ramirez, Action by the Lower East Side; and Victor Li, student representative.